Spot gthe elusive tiger in the Ranthambore National Park. Dinner at an exclusive venue at jaipur. Experience sundowner cocktails on the sand dunes in Bikaner. Indulge in a royal linch in Udaipur. Saturday Day 01 : Delhi to Agra. The Day 1 begins with a grand welcome at Safdarjung Railway Station, Delhi. Check-in formalities are also carried at Railway station. Day 2 begins with arrival in the city of flavors, marvelous architecture and the land of rich history, Agra. Guests begin their Agra luxury tour by visiting the Taj Mahal; an icon of Love and epitaph of famous Mughal queen, Mumtaz. Post-breakfast guests can either return to comforts of Maharajas' Express or visit the Mausoleum of Itmad-ud-Daulah which is popularly described as "jewel box" or visit the ancient Mughal capital, Fatehpur Sikri as an optional activity. Feast on global delicacies with on board lunch. Afterwards guests can either return to the comforts of the Maharajas' Express or may watch " Mohabbat-e-Taj Show" as an optional activity. Enjoy the sumptuous on board dinner and bid goodbye to Agra and prepare to welcome the state of royal lineage, Rajasthan with Sawai Madhopur (Ranthambore). Arrive at the Pink City - Jaipur. Guests can proceed to visit Observatory, world's largest sun dial which is colloquially known as Jantar Mantar or they can also choose the optional activities such as Spa facilities at a 5 Star hotel or an exclusive private shopping tour . Once the guests arrive in Bikaner they can choose to relax on board or may choose from optional activities such as visit to the Lalgarh Museum or Deshnok Temple, the ancient rat temple. After a lavish on board lunch and then proceed to visit Junagarh Fort. Have an on board breakfast as you arrive into Jodhpur. On 6th day as well breakfast is served on board as you arrive in City of Lakes, Udaipur. 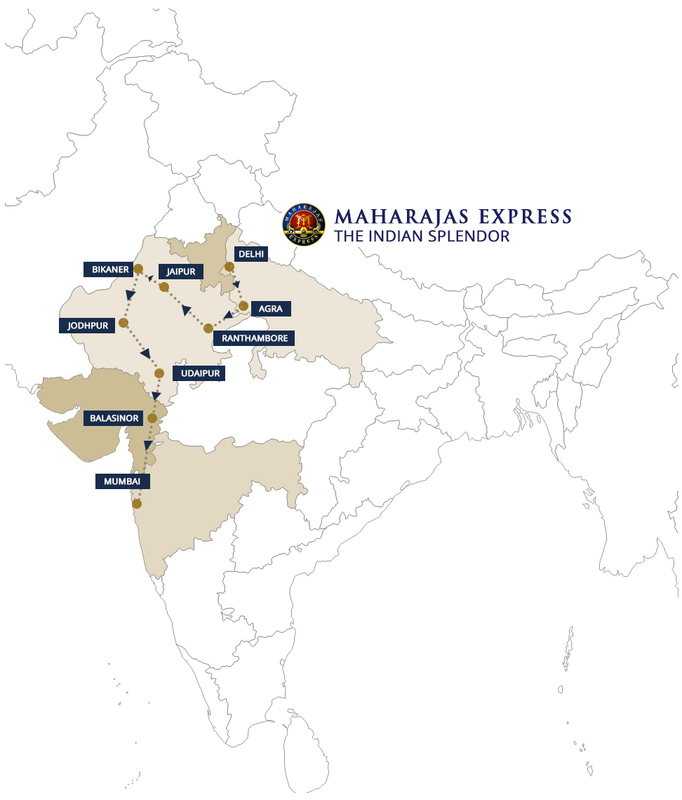 Have dinner on board as Maharajas' Express proceeds for the next destination Balasinor, the land of African culture in Gujarat. Have an on board breakfast and arrive at Sevalia Railway Station. Enjoy a breakfast on board as the train arrives at the home of Bollywood - Mumbai at Lokmanya Tilak Terminus. 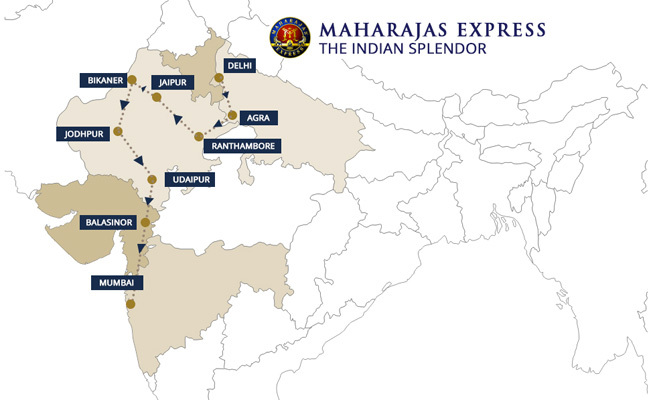 Bid farewell to the Maharajas' Express, the pioneer of Indian Luxury tourism and give us another opportunity to serve you again with boundless luxury!